As an internationally recognized percussionist and composer, Michael Bump brings many years of professional experience in a number of arenas. For over 28 years, he has enjoyed synthesizing and sharing these experiences with his students at universities such as the University of Mississippi, the Ohio State University, and Truman State University, the latter for which he presently serves as Professor and Director of Percussion Studies. He has also served on the faculties of the Tennessee Governor’s School for the Arts, Sewanee Summer Music Festival, and the Illinois Summer Youth Music Program. He holds graduate degrees in Performance & Literature from the University of Illinois (Edgard Varese Percussion Award Distinction), and has studied with such artist-teachers as Fred D. Hinger, Frank Shaffer, Tom Siwe, and Paul Yancich. His orchestral performance experiences include Principal Timpanist with the Ars Nova Chamber Orchestra, Asheville Symphony Orchestra, Brevard Music Festival, as well as Percussionist/ Assistant timpanist with the Columbus Symphony Orchestra, Memphis Symphony Orchestra, Memphis Opera, Chicago City Ballet, and ProMusica Chamber Orchestra. Michael also served as percussion coordinator and arranger for the Memphis Blues Drum and Bugle Corps, as well as an instructor/arranger for the Phantom Regiment Drum and Bugle Corps, and the University of Illinois Indoor Drumline. 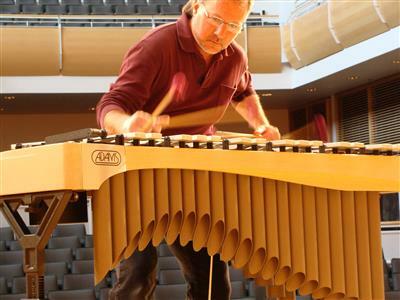 He has given solo performances and educational presentations at venues throughout the U.S. and Europe, including featured soloist/clinician at the Midwest Band & Orchestra Clinic, National Conference On Percussion Pedagogy, as well as numerous State MEA/CBDNA conventions, universities, and conservatories. His recent research sabbatical brought him to Trinidad and Tobago, where he performed with the Woodbrook Invaders at the 2011 Panorama Competition, as well as presented clinics at the University of the West Indies. He currently serves the Percussive Arts Society as Chair of the New Music/Research Committee, and has served as Chapter President in both South Carolina and Mississippi. He has enjoyed appearing as a solo performer and clinician at PASICs, numerous PAS State Chapter events, as well as a contributing author of articles in Percussive Notes and Editor of the Siwe Solo and Ensemble Literature Index of the PAS website. He has also served as an adjudicator for the 2008 PAS International Percussion Ensemble Competition and 2009 PAS Percussion Composition Contest. In addition to serving as an Innovative artist-endorser, Michael is an artist/endorser for Pearl/Adams, Evans, and Sabian Ltd. His works for percussion are published by Arrangers Publishing Co., Studio 4 Productions, Media Press, and Music for Percussion, Inc.